While it doesn’t match the maximum velocity of the bullet train/shinkansen, the Ferry Sunflower’s "Dangan Ferry," or “Bullet Ferry,” allows you to keep in constant motion while traveling halfway across the country for an extremely low price. Travelers on the Dangan Ferry plan can choose from one of three routes. Two routes start in Osaka, with one heading to Oita Prefecture’s Beppu (which boasts some of Japan’s most popular hot springs) and the other to Shibushi in Kagoshima Prefecture. The Third Dangan Ferry route sails between Kobe and Oita City. 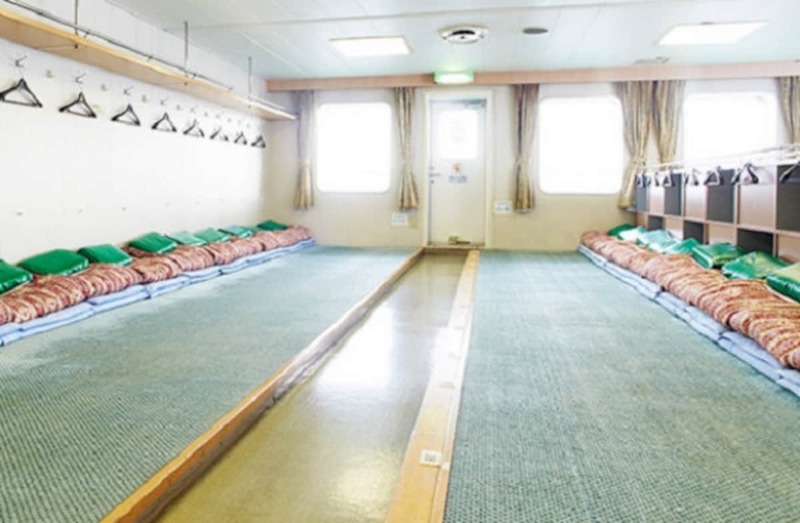 All routes are identically priced on the Dangan Ferry plan, and if you opt for a communal room with sleeping mats, you’ll pay just ¥10,000 (US$91) for the complete round-trip (¥5,000/US$46 for children). To put that in perspective, traveling by train from Osaka to Beppu would cost over ¥16,000 one-way. The accommodations may not be luxurious, but with the money that you'll save, you’ll have more left over with which to pamper yourself once you reach your destination. If you’re willing to splurge, ¥12,340 (US$113) will get you passage in a room with bunk beds, only ¥6,160 (US$57) for kids. As a matter of fact, the Dangan Ferry plan (for which reservations can be made here) is about half the price of Ferry Sunflower’s own standard tickets. The one catch is that you have to make your return trip on the boat leaving the night of your arrival. Travelers on the plan depart at night, arrive at their destination the next morning, spend the day there, then hop on their return vessel that evening, arriving back at the port where their journey began the following morning, two days after their initial departure. Still, with the boats arriving in Kyushu between 6:20 and 9:40 in the morning (depending on route and date), and leaving to return to Osaka or Kobe between 5 and 7:35 p.m., you’ll have several hours in which to hit up a hot spring, dine on local delicacies or otherwise get a taste of what Kyushu has to offer.